A small group of rocky islets in the middle of the ocean seems an unlikely location for human habitation, but when those humans are marine scientists the logic becomes clearer – and even more so when, as Ramón Bonfil describes, the islets are a seasonal home to little-known devil rays. The field station at the Archipelago of Saint Peter and Saint Paul sits only a few metres above sea level and is buffeted by the region’s storms. A few hours after darkness recedes and morning light fills the entire sky, we begin to distinguish the low silhouette of the rocky outcrop on the horizon just in front of us. It has been a long and tedious voyage from the Brazilian island of Fernando de Noronha: two days and two nights in a 20-metre (65-foot) fishing boat, with not much to do but look at the sea and sky for endless hours or lie in our tiny bunk beds to avoid seasickness and keep some food in our stomachs. But now, finally, we are closing in on our destination and excitement replaces boredom. Soon we will arrive at one of the most remote and inhospitable marine paradises on earth, a place of rough beauty where a few rocks are surrounded by deep blue seas full of marine life. We are heading to the Archipelago of Saint Peter and Saint Paul, known in shorthand as the ASPSP. These distant islets lie in the middle of the Atlantic Ocean between Brazil and Africa, nearly 1,100 kilometres (700 miles) from Natal at the eastern corner of Brazil and 800 kilometres (500 miles) from Fernando de Noronha. Spearing out of the sea surface from depths of 4,000 metres (13,000 feet), they are one of the few outcrops of the submarine mountain chain of the mid-Atlantic Ridge, a place where the sea floor is continually spreading as the earth’s crust gives way to new material from the planet’s core. There are only nine places in the Atlantic Ocean where this mountain chain emerges from the sea to form landmasses with enough area to offer refuge for marine birds and sailors. But what makes the ASPSP unique is the fact that, of all the mid-Atlantic outcrops, it is closest to the equator and by far the smallest. The archipelago comprises just four small and six larger islets, as well as various rock points, and the longest distance between two points is just 420 metres (460 yards). In addition, it sits in an enviable location, between the northern and southern hemispheres and halfway between the American and African continents. The first recorded landing on the ASPSP was by the Frenchman Bouvet du Losier in 1738. Several other explorers followed, including notable visitors such as Charles Darwin, who landed here in February 1832 during the HMS Beagle expedition, and Ernest Shackleton in 1921 aboard Quest. Numerous scientific and trade voyages set foot here, including the HMS Challenger marine research expedition in the 1870s, but the place remained of little interest to colonising nations and maritime empires due to its perceived poor value when compared to other treasured prizes that could be claimed and exploited. Brazil’s possession of the archipelago was a de facto inheritance when it gained independence from Portugal. The islets remained largely in oblivion for a very long time, until the first lighthouse was erected in the 1930s. Later, in 1960, they had a claim to fame as the starting and end point for the first submerged circumnavigation of the world, made by the nuclear submarine USS Triton. This tiny place is a jewel of marine life. Although the only permanent inhabitants of the dry rocks are brown boobies, noddies of two species and red rock crabs (and four human researchers at a time! ), the waters around them hold several species of algae, invertebrates, cartilaginous and bony fishes, and marine mammals and reptiles. The known diversity of species is modest, due partly to the small size of the archipelago and partly to the difficulty of exploring its deep-water fauna, but the abundance and beauty of some species is great. The current biodiversity list runs to at least 107 phytoplanktonic and 205 zooplanktonic taxa, 32 sponges, 81 taxa of molluscs and 123 fish species. Common inhabitants of and visitors to the ASPSP are yellowfin and bigeye tuna, white and blue marlins, several species of jacks, flying fish, silky, Galapagos, dusky and whale sharks, giant manta rays and two species of devil rays. In addition, there are plenty of green and hawksbill turtles, and the always-thrilling bottlenose dolphins. Waves crash against the rocks of the Archipelago of Saint Peter and Saint Paul. Although part of Brazil, these islets lie in the middle of the Atlantic Ocean. For several decades the waters around the archipelago were heavily fished for pelagic species, which led to some becoming less abundant and the unfortunate mistaken perception that the Galapagos shark Carcharhinus galapagensis was ‘locally extinct’. Indeed, sharks had been extremely plentiful here before fisheries exploitation expanded to the high seas and they have certainly decreased in abundance (as they have everywhere else in the world because of overfishing). However, the claim that the Galapagos shark was extinct here has proved to be erroneous. A team of scientists from the Universidade Federal Rural de Pernambuco (UFRPE) in Recife, Brazil, has been working with sharks and rays at the ASPSP for the past 10 years and they have captured and tagged several Galapagos sharks during that period. I was fortunate to participate in their research during this trip and I personally saw and helped tag two Galapagos sharks. This species clearly has not been extirpated from the area and is still as abundant as the silky shark. Important not only for its biodiversity and ecology, the ASPSP also holds a huge strategic value for Brazil. The nation has made a concerted effort to keep a permanent human presence in the archipelago by establishing in the late 1990s an impressive research station specially designed with innovative technology to be able to withstand the harsh environment of its location. It is because of this research station that I was able to come to the ASPSP on what is my second adventure to this magnificent place. We came to look for Chilean Mobula tarapacana and bentfin M. thurstoni devil rays, species that are seasonally abundant in the archipelago. A team from UFRPE, led by Professor Fábio Hazin and PhD students Sibele Mendonça and Bruno Macena, has been studying them for the past few years. While I was a visiting professor at UFRPE in 2013–2014, I decided to contribute to this conservation research by joining the study, and was lucky to come here for the first time in 2014. By now we have strengthened our collaboration and have teamed up to continue researching the ecology of these mysterious ‘sea birds’. Devil rays and their larger cousins, manta rays, are facing increasing threats in several parts of the world due to a huge demand for their gill plates in the Chinese ‘traditional’ medicine market. There is, however, nothing traditional about this trade. The use of the gill plates of devil and manta rays in Chinese medicine is very recent, having been successfully introduced by some canny traders without any scientific proof of the plates’ curative efficacy. Mobula rays visit the archipelago seasonally and then leave again. Researchers are looking into how and why they use these islets. The problem is that devil and manta rays cannot sustain heavy fishing because, like many other sharks and rays, they are slow growing and have only one offspring per reproductive cycle. This means that their populations cannot recover quickly from losses due to fishing. To make things more complicated, we know relatively little about the biology and ecology of devil and manta rays. So, we have come to the ASPSP to find out how the rays use this oceanic oasis; what other areas are key to them during their life cycle; what their migratory routes are; and how these might take them to areas where they are more likely to be caught and killed by fishers. Fortunately for the rays, they are fully protected by law in Brazilian waters, so this mid-Atlantic archipelago is a haven for them. The information gathered during our studies will help to set up specific conservation strategies that are based on the best available scientific information, and hopefully they will contribute to the rays’ eventual listing in Appendix II of CITES. This would help control the unrestricted international trade in their gill plates, which constitutes the major threat to the survival of populations into the future. The work we do here with Chilean and, to a lesser extent, bentfin devil rays is some of the most rewarding I have had the fortune to carry out in my 30 years as a shark and ray researcher and conservationist (although my research into great white sharks in South Africa, New Zealand and Mexico also rates very highly). The 15 days we spend here during each expedition are among the most relaxing yet thrilling experiences I can remember. Meaningful and cutting-edge conservation research, adventure and pleasure all at the same time – what more could I wish for? The weather is enviable, a nice 25 ˚C (77 ˚F) , and the sun, breeze and warm blue waters entice us into free-diving for as long as we want. And the wonderful devil rays, with their regal underwater flight, are exquisite as the sun’s rays fade quietly into the deep blue sea. We spend hours on the leeward side of the islets, either swimming around the boat that serves as the main support for our research activities or sitting on its deck looking out into the blue surface and waiting to see the unmistakable diamond shadow of the devil rays. When Chilean devil rays approach, we swim towards them and our hearts immediately begin to race. Our aims are to tag them with the satellite-linked electronic tags that enable us to follow their movements for up to a year or to take very small samples of their skin and muscle. We use specially designed tips for both of these tasks, mounted on a pole-spear. Fortunately for us, Chilean devil rays are curious and tame, normally circling around us several times, going away and coming back a few seconds later. They’re checking us out inquisitively and sometimes even approach us directly and almost bump into us. This facilitates our work and enables us to calmly and precisely insert the dart holding the tag towards the rear of the ray’s back and just a little off the midline, so as to secure it on its muscle mass without touching any internal organs. The Chilean devil rays here reach a disc width of up to 3.5 metres (11 feet) and usually travel in groups of two to five individuals. During this trip, however, we encountered for the first time enormous aggregations of up to 30 individuals in deeper water, out of our free-diving reach, in what might be a gathering with a specific purpose. Bruno Macena satellite tagging a Mobula tarapacana off the Archipelago of Saint Peter and Saint Paul. In contrast to Chilean devil rays, we seldom see bentfin devil rays. This smaller ray reaches a disc width of only about 1.5 metres (five feet), swims extremely fast and is very elusive. We only see the bentfins at a distance; they never approach us or let us get close to them. The only opportunities we have to examine them at close range and obtain tissue samples is when they get caught in the research long-lines that the team from UFRPE uses to catch dusky, Galapagos, hammerhead and silky sharks for other tagging studies. 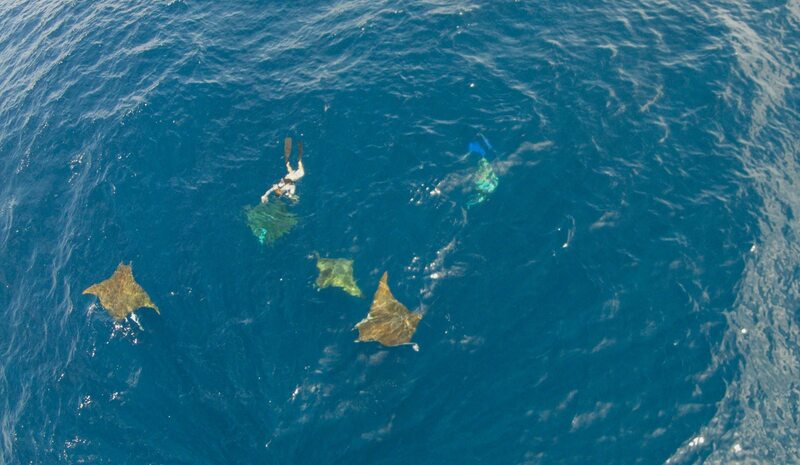 During this expedition, however, we managed to film from an airborne drone a group of four bentfin devil rays. They passed our boat quickly, swimming at the surface and appearing to chase one another. After filming and photographing them for a while, we analysed the video and realised that this was probably a courtship ‘train’ of three males chasing a female and trying to copulate with her. This is probably the first time such behaviour had been captured on film for this species! The efforts of our joint research have started to yield some interesting results. Two of the four Chilean devil rays we tagged last year spent a few months at the ASPSP and then travelled towards West Africa. With the three additional tags we deployed during this trip we hope to continue to unveil their migratory routes and complete their movement cycles. The tissue samples we have obtained from both species will be key to a collaborative effort with The Manta Trust to develop an identification kit that will facilitate better documentation, and eventually control, of the trade in devil and manta ray gill plates around the world. Very soon I will start similar research with Océanos Vivientes AC off the north-eastern Yucatan Peninsula in Mexico, studying Atlantic devil rays Mobula hypostoma with partial funding from the Save Our Seas Foundation. We hope to be able to continue working here and in Mexico for several years to unveil the complete biology and ecology of these majestic, but poorly understood rays and to contribute to their conservation and continued presence in our oceans for future generations to enjoy. 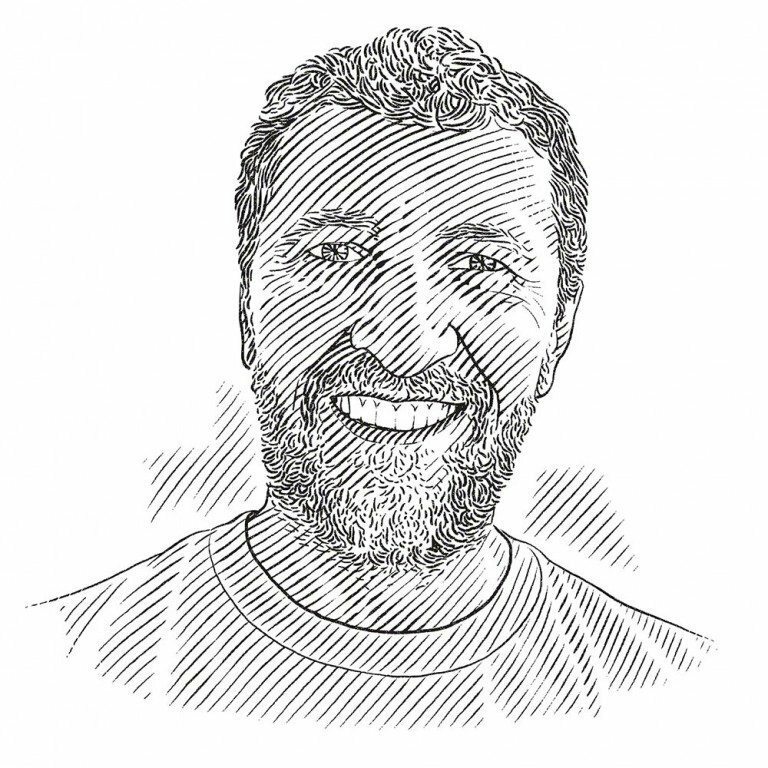 Save Our Seas Foundation project leader Dr Ramon Bonfil is studying Latin American devil Rays at St Paul's and St Peter's Archipelogo, remote islets in the mid-Atlantic Ocean. In this video, he flies a drone around this remote archipelago to get a better understanding of the environment.